2012 EuroLeague Women - What did we learn from the performance this week? The confusion about the EuroLeague Women qualification system has been the hot topic of the week. Yet it should not be difficult to understand. The top 5 from each group qualify for the next phase. Galatasaray Medical Park's top 5 finish simplified the whole process. Galatasaray as hosts move into the Final 8 direct while the other 14 teams play off in a best of three series, with the winners qualifying for the Final 8. How complicated can it be to determine the brackets for the second round draw? Using the FIBA Europe method of the past it should have been easy but as explained last week, the qualification system was changed. A friend of ours from Latvia Jānis Kacēns who is a prolific writer on women's basketball and today the main contributor at lovewomensbasketball.com has gone to great lengths in explaining the qualification with the latest ranking positions. UMMC Ekaterinburg do not lose often in their arena but they were no match for Ros Casares (63-81) in what turned into an excellent game of basketball. Unfortunately the spectacle was spoiled for UMMC with the injury to Anete Jēkabsone-Zogota during the first quarter as you can see in the video. She was leading her team with 9 points at the time. Jēkabsone-Zogota was seen leaving the game on crutches. So we will have to wait on a medical report from the club to know more. In terms of the game what can one say except watch the FIBA TV highlights when they become available. For Ros Casares Lauren Jackson was on fire during the first quarter. Ann Wauters and Isabelle Yacoubou-Dehoui (16 points) were electrifying throughout the game while Silvia Dominguez was a handful. In total it was a united performance that resulted in 20 assists. For UMMC Sandrine Gruda stepped up in the absence of Jēkabsone-Zogota to score 20 points. Galatasaray Medical Park may have lost Gülşah Gümüşay and Alba Torrens for the season with knee injuries. They also had to play without Saziye Ivegi who picked up an ankle injury. But this did not stop them from beating Bourges Basket (81-74). For once Diana Taurasi was in the background offensively although having 5 assists. Instead it was the duo of Tina Charles and Epifaniya Prints with 25 and 28 points each that did the damage. 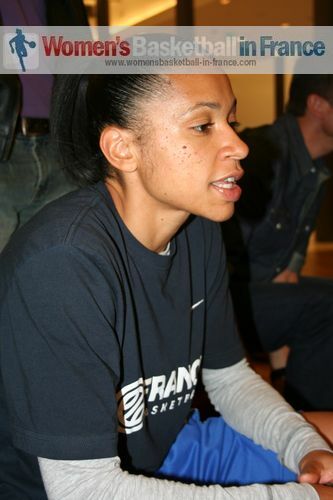 Elsewhere in the group ZVVK USK Prague, led by DeLisha Milton-Jones with 14 points, beat Seat Unisze Györ (74-63). In the scratch match between teams already eliminated VICI Aistes lost at home to Lotos Gdynia (60-74). Jolene Anderson regained her scoring touch with a game high 22 points for the victors. What we learned this week from EuroLeague Group A: Ros Casares mean business. Galatasaray have a trick or two up their sleeves while UMMC are not as strong as they look on paper. EuroLeague Women B - Is it possible not to speak about Angel McCoughtry? Who wants to be in the shoes of head coach George Dikeoulakos despite his club Fenerbahçe winning in EuroLeague Women? Trailing (32-36) at the interval, he needed to find the right words to get his players going. While Dikeoulakos explained after the match that the turn-around during the third quarter was due to pure emotion. The energy of Angel McCoughtry (24 points, above in picture) and her ability to score at the right moment lifted her team to take the victory (72-60). In the other games from the group UNIQA-EuroLeasing Sopron (already eliminated) beat Beretta-Famila (69-54) while in the match of the evening from this group Tarbes fell at home in overtime to CCC Polkowice (96-99). Tarbes had the opportunity to win the match in regulation time but Maja Miljkovic missed an "And-1" opportunity after leveling the game (81-81) in the dying seconds of regulation time. Her free throw went astray and CCC Polkowice were able to hang on for overtime. With overtime drawing to its end Florence Lepron from Tarbes scored with a trademark drive to the basket to make it a 3-point game with 10 seconds to play (96-99). Tarbes needed to foul their opponents in order to stop the clock and and have a chance of getting the ball back. They failed to foul and the chance of giving their home fans a victory in the EuroLeague Women was gone. Ana Cata-Chitiga and Florence Lepron scored 23 and 22 points for Tarbes while Iva Perovanovic poured in 32 for CCC Polkowice. Sparta&K Moscow Region did Lattes-Montpellier a big favour earlier in the day by beating Cras Basket (77-58). Cras Basket started well (18-18) but fell apart in the second quarter (8-24) and never recovered. With this defeat Cras Basket found themselves eliminated from the EuroLeague Women campaign. Rivas Ecópolis beat Wisla-Can Pack (71-66) in a tight match. Sparta&K Moscow are the new leaders of Group C because of this result but are ranked lower than Wisla-Can Pack for the second round draw. Good Angels Kosice held off Lattes-Montpellier (70-61). With Natalia Vieru in foul problems early the Good Angels had to rely on the fire power of Danielle McCrayble with 24 points to get the job done. Edwige Lawson-Wade (in picture) had a game high 26 points in defeat. Round 13 was another sorry night for clubs from the Ligue Féminine de Basketball. In the group's remaining scratch match Gospic Croatia beat Frisco Brno (73-62). Although Montpellier and Bourges Basket have qualified for the next phase of the competition, they now have to step up another level to be one of the eight teams in the Final 8.